The Green Bay Packers have moved on from Ha Ha Clinton-Dix in the eleventh hour of the trade deadline. The Packers traded Clinton-Dix away to the Washington Redskins for a fourth-round pick. Clinton-Dix will join D.J. Swearinger on the back-end of the Redskins defense to form the highest-graded safety tandem in the NFL and will try to help the Redskins to maintain control of the NFC East and secure a playoff berth this season. Clinton-Dix has a grade of 83.5 and is currently the fourth-highest graded safety in the NFL, just two spots behind fellow Redskin D.J. Swearinger. His 82.7 coverage grade also ranks fifth among the active safeties who have played at least 300 snaps this season. Like Swearinger, Clinton-Dix has been an extremely valuable safety due to his ability to force turnovers, as his four turnovers forced is tied for the second-most among players at the position. The former Alabama safety can cover the field very well. His 0.23 yards per coverage snap ranks ninth among qualifying safeties, and he has allowed just 8.1 yards per reception, which ranks 16th. On 11 targets, Clinton-Dix has allowed just seven receptions for57 yards (20 came on one play, his longest allowed of the season) and he has allowed a passer rating of 76.7 on throws into his primary coverage. He has also been effective on his 13 pass-rushing attempts, generating a sack, a hit and a hurry. The need for a safety to provide quality production opposite D.J. 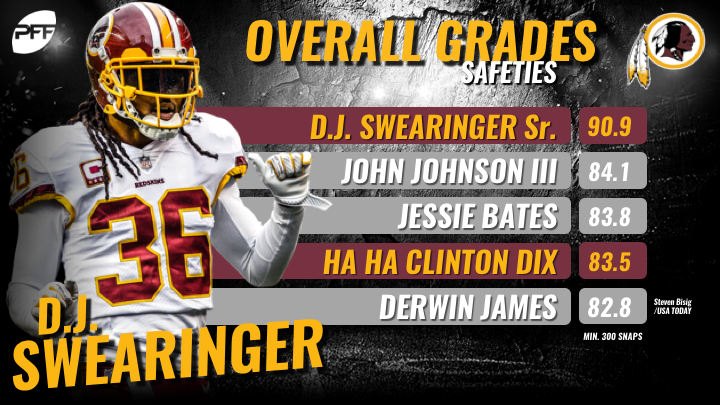 Swearinger, PFF’s highest-graded safety, was painfully apparent, as Montae Nicholson was not getting the job done. Across 441 snaps this year, Nicholson has earned an overall grade of 49.2, a coverage grade of 45.6 and a putrid tackling grade of 28.5. 75 safeties have played at least 200 snaps, and in the categories mentioned above, Nicholson ranks 72nd, 73rd and 75th, respectively. He also allowed a passer rating of 129.2 on throws into his coverage, which ranks 65th among qualifying players at the position. To say the Redskins made a tremendous upgrade to their defense would be an understatement. They go from the third lowest-graded safety to the fourth highest-graded, and this will significantly cut down on mistakes on the back end of their defense. Clinton Dix is a playmaking safety who doesn’t give up many big plays and is much sounder in both coverage and run-defense than Nicholson. The pairing of Ha Ha Clinton-Dix with D.J. Swearinger gives the Redskins one of the most lethal safety duos in the NFL. On any given play, the two are a threat to force game-changing turnovers and will prevent big plays, allowing the Redskins to play with the lead and ride their strong running game. The aggressive move signifies that the Redskins are ready to take hold of the NFC East and make a playoff run this season.